What is it now with that red glaze; is it copper oxide, magnesium, iron or manganese? Let's do some chemistry. Copper oxide or Cupric Oxide has the chemical formula CuO. It's a black material, which can be mined. When mixed with the rest of the glaze components and fired in a regular kiln above 1000 °C, a nice green glaze is obtained. So nothing red! Why are we bothering with copper then? Under normal firing conditions, this reaction does not occur, but when a reducing environment is created (wet wood on the fire, for example, will produce CO), this reaction takes place. And the cuprous oxide is red, bright red. That's what we want. 2) You need to be able to make a well controlled reducing environment. The trick is to stop after the first reaction. This can be partially achieved by adding extra ingredients to your glaze mixture, an art virtually lost after the Ming dynasty. For example, in contrast to your expectations, an extremely low concentration of copper in the glaze (i.e. 0.2-0.5%) gives best results (the most bright red color). Higher concentrations of copper will lead to the formation of Cu in the glaze (the 2nd reaction) and you get brown areas. Quote from the list: The effect is simulating copper red that has misfired to a brownish hue seen on many legitimate Yuan and Ming underglaze red vases or bowls. In the same way, too high CO concentrations will have a similar disastrous effect (and too low concentrations will create an ugly purple mixture of red and green). I think the pictures of shards submitted to this list were great. The last picture on the post of January 28, clearly shows that in areas where the copper concentration was too high, browning of the red has occurred. This is where the modern porcelain makers tend to fail. In an electrical porcelain kiln it's rather difficult to obtain reducing conditions at all and if you can obtain them careful control is impossible. So everybody trying to make those Ming vases with an electrical kiln is usually out of luck. The people with wood fired kilns are better of. The main problem, is that you have to be very patient. In order to get the right reducing atmosphere, you have to control the cooling period carefully (rather weeks, than days) while controlling the CO concentration. Nowadays time = money, so we don't like to wait. So what have we invented. We use iron oxide instead (Fe2O3) and this will stay red under oxidative conditions (when you reduce it it turns black to FeO, but that's not occurring in a modern kiln if you supply enough air). The problem is that iron oxide is usually much more red, a little too red for Ming wares. This is where the remaining chemical comes into play. Quote from the list: ....... some novice claimed the color must be made from magnesium glaze. Obviously that person has never fired a piece of clay in their entire life! No indeed, Magnesium has nothing to do with this discussion, but it wasn't brought up either (at least I couldn't find the post). Magnesium oxide (MgO) is a matting agent in glazes, but doesn't give much color. I did find two posts on Manganese though, which is another element. Quotes from the list: (1) The underglaze red pigment appears to be iron mixed with manganese and not copper which would account for the pinkish-purple hue and watery appearance and brownish blotches. (2) ....... but that red ... is that really copper - to me it seems more like Manganese? And that's where we find the answer. Manganese Oxide (MnO or MnO2, depending on the firing temperature) produces a nice purple color. 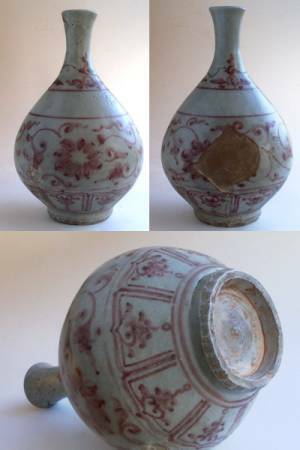 This color is closest to a slightly ill fired product from the Ming dynasty. It's cheap and easy. What else do we want? Perhaps a few brown spots? No problem, just add some grains of iron oxide and you have it. I am sorry, if this was too boring for everybody, but I thought some background info might be helpful.